was born on December 16, 1933, in Cedartown, Ga., where he lived his entire life. Cedartown Fire Department where he served until joining the Cedartown Police Department. He will be remembered as the police department's first Motorcycle officer. He next became an agent of the State Fire Marshall's office where he served until his retirement in 1987. 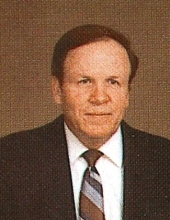 Mr. Merritt also served as a City Commissioner for several terms and served as Commission President. He was also a member of the Georgia State Peace Officers Association and the Lions Club. He was a member of Kresge United Methodist Church and also attended First Baptist. Funeral services for Mr. Merritt will be conducted in the chapel of Smith & Miller Funeral Home on Sunday, November 19, at 3:00 PM with Mr. Mike McRae, Mr. Steve Miller and Mr. Norman Smith officiating. Interment will follow in the Greenwood Cemetery. Active pallbearers will include: Shay Moody, Bobby Brooks, Darrell (Scooter) Stephens, Jr, Lee Brown, Jeff Dingler and Van Dingler. Honorary pallbearers will include: Darrell Stephens, Sr., George Knight, Raymond Coley, Earle Ellis, Hoke Smith and current and former City of Cedartown employees. The family will receive friends on Sunday from 12:00 noon until the funeral hour at the funeral home. In lieu of flowers donations may be made to Homestead Hospice, 1 North Tennessee Street Cartersville, GA 30120 in memory of Mr. Merritt. The Smith & Miller Funeral Home of Cedartown is honored to serve the family of Mr. Ray Merritt. To send flowers or a remembrance gift to the family of Ray Merritt, please visit our Tribute Store. "Email Address" would like to share the life celebration of Ray Merritt. Click on the "link" to go to share a favorite memory or leave a condolence message for the family.